I have a keen interest in industry developments that could give our clients an edge and John Lothian’s “Putting on My Broker Hat About Bitcoin” got me thinking about the imminent listing of Bitcoin futures at the CME and CBOE’s Chicago Futures Exchange. Crypto-mania commentary has focused on the merits of Bitcoin and how the associated technology might revolutionize finance and other aspects of our lives, but I do not see much earnest technical analysis of the system and its flaws. Note first that Bitcoin is neither currency nor commodity, but simply convention. In order for parties to exchange value, a transaction is processed following prescribed rules by a ‘node’ (participating computer) and added to the blockchain, a public ledger of all Bitcoin transactions since its origin. Later, convention dictates that other computers independently confirm that this transaction took place. Roughly 11,000 computers, located across the world (https://coinmap.org/#/world/39.50404071/-0.70312500/2) share this convention. Participants in the transaction verification process are called ‘miners,’ though a more apt description might be ‘transaction verification agents.’ Miners are compensated both with fees deducted from each transaction and a lump-sum reward when a new block of transactions is added to the ledger, all denominated in Bitcoin. Miners either run a full node using their own specialized computer hardware or lend a piece of their existing computing power to a mining ‘pool’ in exchange for a pro-rata portion of that pool’s revenue. Bitcoin touts itself as a decentralized payment network, but in practice, it’s not entirely egalitarian. A more internationally diversified network of ‘miners’ would add stability and reliability (https://blockchain.info/pools). Chinese mining pools currently dominate transaction verification, controlling more than 70% of the aggregate computing power. It’s important to note that while a pool may comprise thousands of individuals, a single pool administrator controls operating procedure, concentrating network authority in few hands. Also consider that many Chinese pools, for-profit enterprises, operate using government-subsidized electricity, exposing the network to foreign political risk. One wonders what might happen to Bitcoin if another of the ever-growing population of cryptocurrencies, possibly by becoming temporarily more profitable, diverted the attention of a large portion of the mining network away from Bitcoin. Just look back to the middle of November (https://blockchain.info/charts/avg-confirmation-time?timespan=30days), when a technical conflict in the mining community regarding how to advance the underlying technology increased average transaction confirmation time to a peak of more than 20 hours. This days-long ordeal degraded network stability and more than tripled average fees from $6 to 20 USD (https://bitinfocharts.com/comparison/bitcoin-transactionfees.html#3m). The vulnerability of the network to the whims of its mining pools represents an obstacle to widespread acceptance of Bitcoin as a trusted mechanism of exchange. Additionally, the current average fee of roughly $6 to send Bitcoin renders it unviable for small retail transactions. Bitcoin’s meteoric price rally has been accompanied by extreme volatility, with annualized averages between 70 and 80 percent, and frequent spikes over 100%, placing it more in the realm of risky assets than investment grade value stores. While our options trading clients would love more market volatility, assets whose prices evolve with 80 or 100 Vol are dicey. Bitcoin must stabilize before it will be considered by institutional investors. Proponents argue that listing futures on DCMs such as the CME and CFE will dampen price gyrations, but the loose federation of 20+ ‘cash markets’ underlying these derivatives is far from stable, producing a considerable replication challenge for would-be market makers. Until some of the issues discussed above are resolved, it is difficult to classify Bitcoin as an asset. It is rather more of a convention or protocol that will probably yield interesting projects in the future, but it is a work in progress. I fully expect substantial revisions will be adopted to address Bitcoin’s serious problems: it is enforced by a relatively small, unaccountable, group of foreign operators, making network stability an issue; it’s too slow and expensive to compete with other domestic methods of money transfer; and its price is extremely volatile. It seems as if no one would opt to send money this way, yet hundreds of thousands of transactions, totalling billions of USD, take place every day. All are curious to see how this month’s new futures contracts trade. Margining is tricky, and Mr. Peterffy’s well-articulated concerns about clearing segregation are sobering. It will be interesting to see the implied carry cost in how rolls are priced, and whether significant CBOE vs CME arbitrage opportunities arise. Bitcoin is confusing because it differs so strikingly from more familiar asset classes. Of course, in our industry, this creates opportunity for those who see first how to resolve and exploit the confusion. In a couple years, we might well be unravelling how they figured it out, marveling at the fortunes they made, and wishing we too had been so smart. As the holidays approach, we reflect on an eventful and productive 2017. Conversations with a diverse group of potential customers we met at various industry events revealed new market opportunities and began what we hope will be several mutually beneficial relationships. We adapted our strategy accordingly, broadening our focus, which has traditionally concentrated on options trading, to include futures and introduced our new product, BTS Spark. We joined the Futures Industry Association (FIA) and the Securities Traders Association of Chicago (STAC). FIA is a leading global trade organization for the futures, options and centrally cleared derivatives markets. Their mission supports transparent and competitive markets, protects and enhances the integrity of the financial system and promotes high standards of professional conduct. STAC comprises individuals in the securities space working to improve the ethics, business standards and working environment of its members. As members of these organizations, we will work with colleagues to meet challenges and influence best practices. We attended conferences including FIA Boca, The Trading Show in Chicago, the Options Industry Conference and FIA Expo. We gained insights into users’ experiences - what they do and don’t like about existing products and what they wish someone would build. We found demand for lower latencies, more control over server hardware and better support from vendor partners. We introduced our futures trading platform, BTS Spark at FIA Expo, to meet emphatically all of those demands. We collaborated with Celoxica to offer an accelerated version of our futures platform with expanded market coverage. The result is far less market data jitter through lower, deterministic latencies and superior overall trading performance. Our product also includes a lower latency spreader and a front-end User Interface with API access. Written in C++ for minimal latency, it can be collocated on private or shared servers. In 2018, we will continue our involvement with FIA and STAC and will work closely with Celoxica to bring you the lowest latency, most dependable futures trading platform available. We look forward to seeing all of you at industry events, and we wish you and your families the best this holiday season and hope you will have a prosperous 2018. We want to take this opportunity to wish you a Happy Thanksgiving. 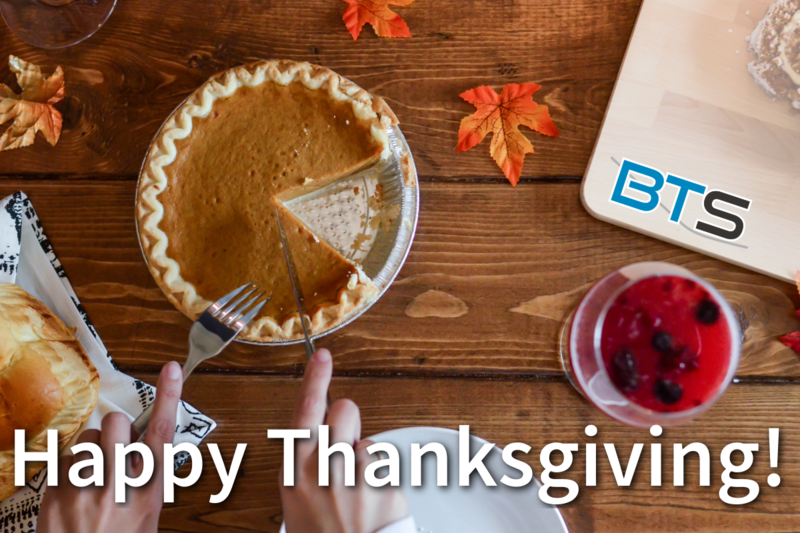 We are grateful for the opportunity to work with you and provide you solutions that keep you at the cutting edge of derivatives trading. We hope you enjoy the holiday break. BTS has deep roots in electronic options trading; that experience has helped us to refine the user interface of BTS Edge into something intuitive for use on the floor and comprehensive enough for use on the desktop. In this video, see how efficiently you can RFQ and create an electronic eye task on a handheld tablet while on the floor. 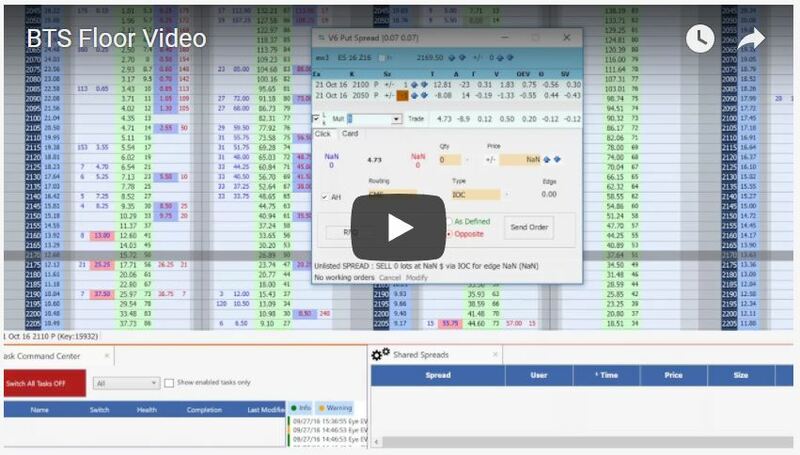 We show you how you can view the Greeks and manage shared spreads all without leaving our trading sheets. Watch the video below and contact us, with questions or to set up a one to one demo.